What really knocks me out is a book that, when you’re all done reading it, you wish the author that wrote it was a terrific friend of yours and you could call him up on the phone whenever you felt like it. That doesn’t happen much, though. Where I could see by my reader’s comments (or the look on their faces)--that they ‘got it,’ that my story was their story too. Where I had the privilege of reading inspiring stories and then having one of those conversations with the author--the kind that Holden Caulfield dreamed of. My time spent in small writing communities has taught me that sharing your work is maybe as important to the writing process as the hours you spend pounding they keys, or scribbling into your notebook. That finding other writers who 'get you,' and forging a relationship with them, is worth the work. And that it all starts by being willing to share--at first with people you don't know that well--yet. Maybe you’re like me and are on a quest to find a ‘home’ for your writing, and maybe for yourself as a writer? Today, I'd like to invite you to join me on my own search for inspiration and to learn from 5 writers who are sharing their work right now. Who have been generous with their writing and in sharing their experience. Who have inspired me as I search for a 'home' for my personal writing--and for myself as a writer. Who will inspire you too. Enjoy the tour. See if any of these ways of sharing your writing sounds like 'home' to you. Looking for meaningful ways to share your writing and reach out to other writers? Take inspiration from these 5 people. 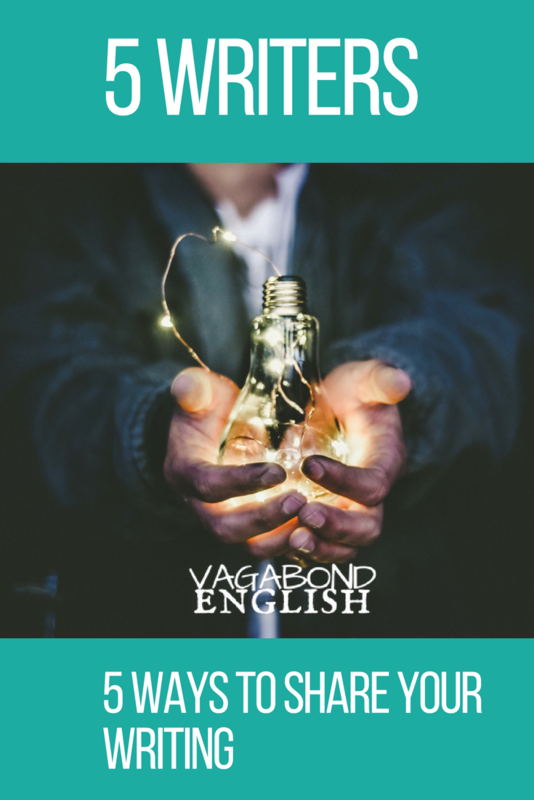 I've been following Grazyna's DIY English group for some time now, and here's what she's taught me: A Facebook group can be a spontaneous and effective way to share your personal writing with a small community. As a little food for thought, here's Grazyna on her first attempt at sharing her work on Medium and why she switched to her Facebook group. My point is not to argue you can't be happy sharing your work on Medium (read on, you'll see). But here's the thing: you have to think about what works for you. And what works for you may be a smaller, more intimate community with whom to share your writing. Is a small Facebook community the best home for your writing? If you know a few people whose opinion you trust, and who might like to read your writing, this can be a meaningful way to share with that small group. It's the kind of place that fosters discussion. And it's a place you can share your work without having it be completely public. That can come in handy if you decide to make changes, or publish your work later. Picture me: Sunday mornings in front of a cozy fire, fuzzy slippers, a warm cup of coffee having a little 'me time' and enjoying the latest edition of The Loafer. What's special about this newsletter? Well, of course, the writing, the reflections on slow-living, the moments captured, the poetry, Mathieu's unique writing voice. And then there's the format of this newsletter. The Loafer shows up in your inbox and you feel like you're reading a letter from an old friend. Here is one of my favorite editions--so far. (Be sure you don't miss the poem at the end.) By the way, you can sign up for The Loafer here. Why share with a newsletter? Mathieu is a freelance copywriter and editor--so, like many of us, he's already writing. If you already have an online writing presence and you want a separate way to explore and share another side of your writing, a newsletter seems like perfect way to do that. And if you're looking for a way to share your personal writing in a way that is meaningful and intimate--you might want to take a little inspiration from Mathieu. Want a short, sweet and self-paced creative writing course? Want an invitation to a small community where you can share your story? Ana Miranda: Literacy, stories: one website. Maybe we couldn't all pull this off, but Ana's fiction writing compliments her online presence as a teacher who helps expat parents raise biliterate children. Sharing my writing has made me more aware of editing - word choice, clarity, flow. I also feel a connection to the reader, even if I have no idea who might be on the other side. It’s intriguing and inspiring. Should you share your writing on your professional website? Is there a way that a collection of your writing, fiction, poetry or personal essay could fit into your professional project? Could a well-crafted story help your readers connect with you as a person? Does your creativity or ability to express yourself matter to your audience? If the answer is 'yes.' Then you've got something to consider. While I'm not saying everyone must have a blog...or that you absolutely need one for your writing... I do want to nudge you in the direction of Fiction from Anna Green where Anastasiia Klimova posts her stories. Actually this page of mine is a rebellious deed, why? Well I used to call myself “a desk writer” meaning hide everything from everyone, or “the questioning author” with WHAT IF? I've already been able to watch her grow. And I'm reminded of the potential we all have to do the same. I've become curious to see where her writing takes her--with this writing project and any others she may undertake. Can you imagine having a blog for your creative writing projects? I used to have a blog for my personal writing, and I have to say that I enjoyed it...but that I can't imagine holding down two blogs at once. Depending on your situation, however, a blog to house your creative writing habit might be just the thing. You can contemplate that question while enjoying one of Anastasiia's stories in this format. Whatever you choose, her work is worth checking out. Have you ever wondered if Medium could be a way to share your writing? Whether you already have an online writing presence or not, it's certainly something to consider. I discovered Alessandro Tinchini and his writing because he was sharing on Medium. And when I reached out to him wondering whether he found the experience meaningful, whether he felt it had helped him grow as a writer, Alessandro was very generous about sharing his experience. I'm glad you're asking what Medium means to me as a writer, because it really is a big deal and helped me discover sides of my creative writing I didn't know before. Writing on Medium is a compelling experience, more engaging than running my own blog and also, it saves many expensive steps that not everyone can afford into building an audience as a writer. Medium helped me be a better writer, I grew without realizing it, because the cultural exchange happens very fast on the platform and if you stay open to tips and inspiration, you only can grow. I'm pretty sure that if you're looking for connections as a writer, you don't need to go any further...and, most important, incredible people who exchange their ideas and points of view through comments. Medium is not just popularity, but it translates itself into what we can call a community. A real one. Alessandro has also published an entire story on writing for Medium this week! So If you're interested finding a home for some (or all) of your writing on Medium, I encourage you to read the entire article. I'm a Medium reader, but not a writer...yet. And Alessandro's post answered so many of my questions. It certainly made me want to give Medium a try. Will Medium work for you? If your goal is to share your work with other writers, and grow as a writer through interaction and feedback, then Medium seems to have everything for you to do that. Is Medium a meaningful place to share your writing? To find a community? I suspect it is--if you gather the right people around you. Wherever you find a home for your writing, wherever you decide to begin your journey to share your writing, build relationships and find community, I hope these 5 writers have inspired you. Does your writing already have a home? Are you interested in sharing your writing in any of the ways we've seen here? Is there another writing community or way of sharing your writing that you think we should know about? Want to weigh in? Want to ask these writers a question? Come on over and mingle with fellow readers and writers at the Vagabond English Book Club. And before we go, a special thanks! Thanks to everyone I mentioned here for sharing your writing and your experience with me. Thanks also to Nicole Bianchi for her wonderful community--Inkwell Writers Mastermind Group where I've been lucky enough to meet many of the inspiring writers in this post. And to Elena Mutonono for her community of teachers and coaches at Opted Out. Newer PostVagabond English Literary Edition--and Celebration!